The Northern Territory Aboriginal Health Key Performance Indicators Information System (NT AHKPI) provides information on and collaboration between both government and non-government health services for reporting key performance indicator (KPI) data on Aboriginal health NT wide. The NT AHKPI program publishes a Public Release Report, the purpose of this report is to present service providers and their communities with findings on Aboriginal health status and how well services are performing for their clients. inform appropriate action, planning and policy development. The system is sponsored by the Northern Territory (NT) Aboriginal Health Forum, which comprises of the Commonwealth Department of Health, Aboriginal Medical Services Alliance of the Northern Territory and Northern Territory Department of Health. Clinical information is being collected from all NT Department of Health services as well as the below Aboriginal community controlled health organisations' (ACCHO) Patient Information Recall Systems. 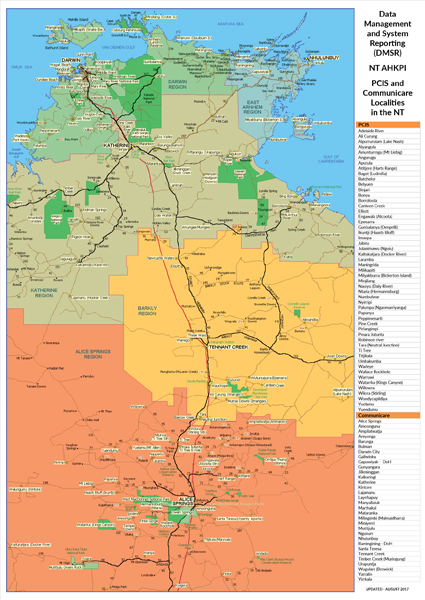 The map below outlines the locations of the Remote Health Centres within the Northern Territory and shows the remote categories for each clinic. If you have any feedback about the NT AHKPIs, the reports, or the need for additional KPIs, please forward them to ahkpi.communications@nt.gov.au. Your ideas will be placed on the Issues Register for consideration by the Working Groups.